Suitable for most chair sizes with washable and easy-care special elastic fabric, making them easy to fit. Washable at up to 40 degrees and you can wash them by washing machine or hand. Widely used for home, Kitchen, hotel, office, wedding, party, celebrations or other special event. 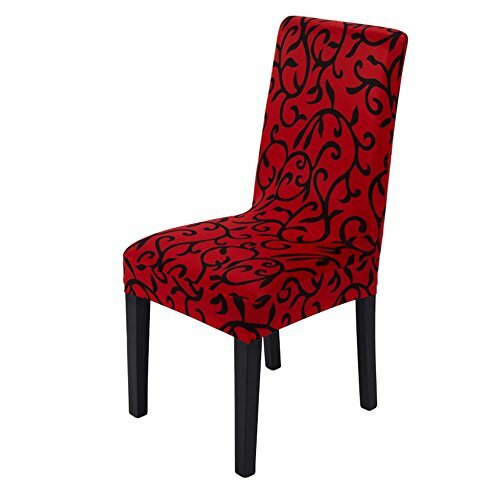 Transform the look of any dining room chair by slipping on this designer look furniture cover. It is soft, comfortable and wrinkle resistant. Color: black and red, black and white, coffee, purple and white. All product images are in kind, lighting, computer monitor differences result in chromatic aberration with the actual products. the final colors will prevail in kind. Hope understanding..